The European Uremic Toxin Work Group has classified uremic toxins into three groups according to their physicochemical characteristics. First proposed in 2003 (1) and last updated in 2012 (2), these groups are (1) low mol wt toxins (<500 D; e.g., urea and creatinine, which are easily removed by current dialysis strategies); (2) medium mol wt toxins (>500 D; e.g., β2-microglobulin, which can be partially removed by dialysis); and (3) protein-bound uremic toxins (e.g., p-cresyl sulfate and indoxyl sulfate, which are difficult to remove by current, even intensive, dialysis) (3). Higher levels of protein-bound uremic toxins are associated with poorer outcomes in CKD. p-Cresyl sulfate is proinflammatory and induces the production of leukocyte free radicals and the release of endothelial microparticles (4). Indoxyl sulfate is associated with IL-6 increase (5), kidney and cardiac fibrosis (6), and kidney disease progression (7). Indoxyl sulfate and p-cresyl sulfate are derived from the metabolism of tryptophan and tyrosine, respectively (8). Protein-bound uremic toxins are characterized by their high plasma protein binding (90%–95% in the case of indoxyl sulfate and p-cresyl sulfate) (8,9). Although their protein binding affinity varies markedly from compound to compound, their free fractions are low overall, leading to poor removal by current hemodialysis and hemodiafiltration methods. Moreover, the free fractions of protein-bound uremic toxins decrease during hemodialysis, further reducing the clearance efficacy (10). Albumin, the principal toxin binding protein, has six subdomains (IA, IB, IIA, IIB, IIIA, and IIIB) and nine fatty acid binding sites (11). Uremic toxins bind to albumin via noncovalent bonds, which form as a result of salt bridge, electrostatic, and van der Waals forces (12). This type of binding is reversible and allows for competitive binding. Indoxyl sulfate and p-cresyl sulfate primarily bind to albumin at Sudlow site 2 with association constants of 0.98×105 and 1×105 M−1, respectively (13–16). Ibuprofen, a nonsteroidal anti-inflammatory drug approved by the US Food and Drug Administration for pain relief, shares the same primary albumin binding site with indoxyl sulfate and p-cresyl sulfate. It also has a greater affinity for Sudlow site 2 (association constant approximately 1×106 M−1) (17,18). In vitro and ex vivo studies have shown that indoxyl sulfate and p-cresyl sulfate are readily displaced via competition by ibuprofen (19,20). 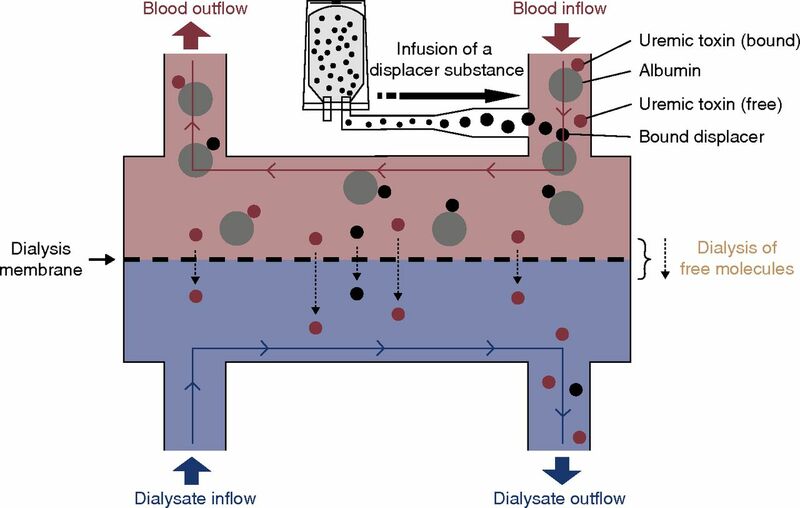 The novel method of infusing albumin binding competitors into the arterial line during hemodialysis has been shown to be two- to threefold as effective at increasing the ex vivo instantaneous indoleacetic acid and indoxyl sulfate clearances compared with conventional hemodialysis without displacer infusion (19,20). Because we were not aware of clinical studies that have evaluated the use of displacers to augment protein-bound uremic toxin removal, we embarked on a clinical proof-of-concept study to further explore the utility of this approach in patients on maintenance hemodialysis. We enrolled patients from the Hemodiafiltration Unit at the Instituto Nacional de Cardiología Ignacio Chávez in Mexico City from March 2016 to March 2017. Inclusion criteria were age ≥18 years old and thrice-weekly hemodialysis. Exclusion criteria were residual urine production >100 ml/d, pregnancy, predialysis systolic BP >180 mm Hg or diastolic BP >115 mm Hg, congestive heart failure New York Heart Association stage 3 or 4, stroke in the past 6 months, cardiac arrhythmia, and hemodynamic instability or gastrointestinal bleeding in the past 6 months. The study was approved by the Ethics and Research Committee of the Instituto Nacional de Cardiología Ignacio Chávez and conducted in accordance with the Declaration of Helsinki. Each subject underwent a single standardized 4-hour hemodialysis study treatment (1.8-m2 polysulfone dialyzer [Fresenius Hemoflow F80A, Fresenius Medical Care, Waltham, MA], blood flow rate of 300 ml/min, dialysate flow rate of 500 ml/min, dialysate temperature at 35°C, and ultrafiltration rate on the basis of interdialytic weight gain). Heparin was administered to all patients (mean initial bolus of 1194 U followed by 972 U/h). The hemodialysis treatment included three phases: (1) preinfusion phase (minutes 1–20), (2) ibuprofen infusion phase (minutes 21–40), and (3) postinfusion phase (minutes 41–240). Standard hemodialysis was performed during the entire treatment. The only intervention was the infusion of 800 mg ibuprofen (dissolved in 250 ml of 0.9% saline solution) at a constant rate into the arterial bloodline at a site approximately 80 cm downstream of the arterial cannula during the infusion phase. No other medications or intravenous fluids were administered during the treatment. The concept of the experimental setup is illustrated in Figure 1. Schematic of the displacer concept. A displacer substance is infused into the arterial (prefilter) bloodline, where the displacer molecule competes with protein-bound toxins for binding sites. This competition results in higher free toxin levels, facilitating higher toxin removal rates. The use of multiple displacer molecules (“displacer cocktail”) is possible and has been tested ex vivo (19). Blood and dialysate samples were used for measurements of indoxyl sulfate, p-cresyl sulfate, tryptophan, ibuprofen, urea, and creatinine concentrations. The sampling time points relative to the hemodialysis start were as follows: arterial (upstream of ibuprofen infusion site) bloodline at 0 (n=10), 10 (n=12), 15 (n=18), 20 (n=12), 25 (n=12), 30 (n=18), 35 (n=12), 40 (n=12), 60 (n=18), 120 (n=10), 180 (n=6), and 240 (n=10) minutes; venous bloodline at 0 (n=6), 10 (n=12), 15 (n=18), 20 (n=12), 25 (n=12), 30 (n=18), 35 (n=12), 40 (n=12), 60 (n=18), 120 (n=6), 180 (n=6), and 240 (n=6) minutes; and the dialysate outlet at 5 (n=6), 10 (n=18), 15 (n=18), 20 (n=18), 25 (n=18), 30 (n=18), 35 (n=18), 40 (n=18), 60 (n=18), 90 (n=6), 120 (n=18), 180 (n=6), and 240 (n=18) minutes and every other 2 minutes between 15 and 55 minutes for the last six subjects. Blood samples were collected in BD Vacutainer SST 5-ml yellow tubes and centrifuged for 10 minutes at 3500 rpm. Thereafter, the supernatant serum was separated and stored in aliquots. Dialysate samples did not require additional processing. All samples were stored at −80°C and subsequently analyzed at the University of Massachusetts Lowell Laboratory (Lowell, MA). For all calculations, although individual data points were missing in some patients, phase averages could always be calculated in every patient (except for ibuprofen, which was not present in the preinfusion phase). Average arterial and venous concentrations were calculated for each phase (preinfusion, infusion, and postinfusion) in each patient, and then, medians across all patients were reported for each phase (see Table 2). Dialytic clearances were calculated per time point and averaged per phase for each subject, and then, the median clearance across patients was reported for each phase (see Table 3). We measured total dialysate and serum concentrations of indoxyl sulfate, p-cresyl sulfate, tryptophan, and ibuprofen in 5-µl samples by HPLC on a 15-cm C18 Kinetix column (Phenomenox, Torrance, CA). The HPLC was an Agilent 1100 system with fluorescence detection. The mobile phase was a gradient from 85% pH 4 ammonium formate/15% acetonitrile to 100% acetonitrile. Full details of the HPLC method are in the work of Tao et al. (19). Calibration was done with commercially available indoxyl sulfate, tryptophan, and ibuprofen (Sigma-Aldrich, St. Louis, MO). p-Cresyl sulfate for assay calibration was provided by Björn Meijers (Universitair Ziekenhuis, Leuven, Belgium). All samples from each patient were analyzed in the same analytic batch. The measurement range for each analyte was determined, taking the lower limit of measurement as signal/noise =10/1, and the upper limit was determined as the maximum concentration for a linear detector response. The measurement ranges were as follows on detectors: tryptophan, 5.1×10−4 to 1.4 mg/dl; indoxyl sulfate, 5.3×10−4 to 1.5 mg/dl; p-cresyl sulfate, 9.4×10−5 to 1.1 mg/dl; and ibuprofen, 2.1×10−3 to 4.1 mg/dl. These linear ranges were suitable for direct injection of dialysate samples. For serum samples, the extraction protocol resulted in a 1/34 dilution, and therefore, the final injected concentrations were in the linear range. All compounds are present at 5 nM or higher concentrations for all time points except for ibuprofen, which is present only during and after the infusion phase. For recovery analysis, a dialysate sample was spiked with indoxyl sulfate stock solution, and recovery of 95%–105% was determined. Measurements had a between-day coefficient of variation of 3%. Urea and creatinine in dialysate were measured on an Envoy 500 clinical chemistry analyzer (Elitech Group, Providence, RI). Urea was measured with a coupled urease/glutamate/nicotinamide adenine dinucleotide reagent (Thermo-Scientific), and creatinine was measured with the Jaffe reaction (Pointe Scientific). On the basis of the total solute concentrations, the clearance at each time point for each patient was calculated as Qd · Cdialysate outlet/Cserum inlet total. Qd is the dialysate flow, which was set constant at 500 ml/min in all experiments. Patient-level clearances were averaged for each treatment phase (preinfusion, infusion, and postinfusion), and therefore, each patient contributed three clearances to statistical analysis. Clearance was calculated for the following minutes (n = number of patients): 10 (n=12), 15 (n=18), 20 (n=12), 25 (n=12), 30 (n=18), 35 (n=12), 40 (n=12), 60 (n=18), 120 (n=16), 180 (n=6), and 240 (n=16). Because the calculation of RR depends critically on the time interval between the two measurements, we restricted this analysis to measurements with exactly 10 minutes between time points 1 and 2 in the preinfusion and infusion periods. Per our study protocol, there was no 10-minute interval between two measurements in the postinfusion period, and therefore, we refrained from reporting postinfusion RRs. The time points used for RR calculations were the preinfusion phase 10 and 20 minutes and the infusion phase 30 and 40 minutes. For this analysis, data from 12 patients were available. Solute levels are reported for the three treatment periods: preinfusion (minutes 1–20), during the ibuprofen infusion (minutes 21–40), and postinfusion (minutes 41–240). Average solute concentrations were first calculated per period for each patient. Then, with skewed data, medians (interquartile ranges) of these averages were calculated across patients for each treatment period. Solute levels in the dialysate outlet stream were normalized relative to their dialysate preinfusion concentrations. The lower 95% confidence limit of the median was calculated as the th ranked value of the dataset (n = total number of data points). The upper 95% confidence limit of median was calculated as the th ranked value of the dataset (n = total number of data points). Clearances, dialysate outlet levels, RRs, and arteriovenous (post- to prefilter) concentration differences were compared between the periods using the paired nonparametric Wilcoxon signed rank test. Eighteen patients were studied: ten women and eight men, age 36±11 (mean±SD) years old, and dialysis vintage of 37±37 (mean±SD) months. Ten patients were dialyzed via arteriovenous fistulas, and eight were dialyzed using central venous catheters. Interdialytic weight gain was 2.5±1.2 (mean±SD) kg (Table 1). 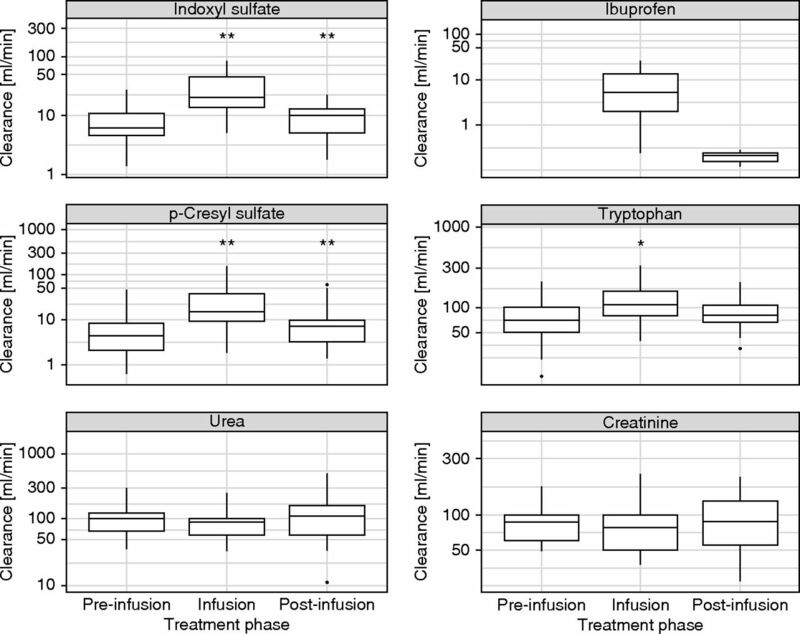 The intradialytic concentrations of p-cresyl sulfate, indoxyl sulfate, tryptophan, urea, and creatinine (normalized to the mean value of the preinfusion period) in the dialysate outlet stream are shown in Figure 2. Median (interquartile range) protein-bound uremic toxin levels (normalized to the mean preinfusion level) in the effluent dialysate before, during, and after ibuprofen infusion were 1.0 (reference), 2.4±1.2, and 1.2±0.5, respectively, for indoxyl sulfate and 1.0 (reference), 2.4±1.0, and 1.2±0.7, respectively, for p-cresyl sulfate (all P<0.001 compared with the preceding treatment phase). These data indicate a marked increase in protein-bound uremic toxin levels in the dialysate outlet stream during the ibuprofen infusion phase. This increase was seen in every single patient studied (individual data not shown). Notably, tryptophan dialysate levels also increased slightly during the infusion period (P>0.05), whereas those of the nonprotein-bound solutes creatinine and urea did not. Detailed time course data of dialysate levels for each subject can be found in Supplemental Figures 1–18. Dialysate solute concentrations before, during, and after the ibuprofen infusion. The concentrations were measured in the dialysate outlet stream, and they are given as relative concentrations normalized to the respective solute concentrations during the preinfusion period. (Left panels) Concentrations of indoxyl sulfate (upper panel) and p-cresyl sulfate (lower panel). (Right panels) Concentrations of tryptophan (top panel), urea (middle panel), and creatinine (bottom panel). *P value <0.01 compared with preceding phase; Wilcoxon signed rank test; **P value <0.001 compared with preceding phase; Wilcoxon signed rank test. Arterial and venous solute levels before and during displacer infusion are shown in Table 2. Serum concentrations in the prefilter (arterial) bloodline upstream of the ibuprofen infusion site represent systemic serum concentrations in the subject. Total solute concentrations pre- and postfilter before and during displacer (ibuprofen) infusion. Ibuprofen was undetectable in the subjects’ serum samples in the preinfusion period. During the ibuprofen infusion, the median arterial ibuprofen serum concentration was 5.1±4.4 mg/dl, indicating successful ibuprofen infusion. Ibuprofen concentration peaked at 40 minutes (Figure 3), and its median concentration postinfusion was 3.3±1.7 mg/dl. Detailed time course data of serum levels for each subject can be found in Supplemental Figures 1–18. Time course of prefilter (arterial) ibuprofen concentrations. Ibuprofen was infused between minutes 21 and 40, and the peak concentration was reached at minute 40. The gray symbols indicate average concentrations. The top and bottom edges of boxes indicate the 25th and 75th percentiles, respectively. Thick lines inside boxes indicate medians. Ends of whiskers indicate minimum and maximum values (excluding outliers), and black dots indicate outliers. The clearances of protein-bound solutes increased significantly during the displacer infusion (Figure 4, Table 3) (all P<0.001). The clearance of tryptophan, a weakly protein-bound solute, increased to a lesser extent (although statistically significant) compared with p-cresyl sulfate and indoxyl sulfate. The clearances of unbound solutes, creatinine and urea, did not change significantly. The median (interquartile range; n=12 patients) 10-minute RRs (percentages) of indoxyl sulfate were 8 (27) and 26 (39) for the preinfusion and infusion periods, respectively. The corresponding values for p-cresyl sulfate were 7 (27) and 24 (46), respectively. Solute clearances during the three treatment phases. *P value <0.01 compared with preceding phase; Wilcoxon signed rank test; **P value <0.001 compared with preceding phase; Wilcoxon signed rank test. Our results show that, during conventional hemodialysis, indoxyl sulfate and p-cresyl sulfate can be effectively and reversibly displaced from their albumin binding sites with the infusion of a displacer substance (ibuprofen in our study) into the arterial line of the extracorporeal circuit. The resulting increase in the free fraction of protein-bound uremic toxins allows for their enhanced removal during dialysis as illustrated by the results of our study. The concentrations of the strongly protein-bound toxins indoxyl sulfate and p-cresyl sulfate in the dialysate outlet stream were shown to be substantially higher during ibuprofen infusion than before or after. In fact, ibuprofen infusion into the arterial line resulted in a roughly 2.4-fold increase in the concentration of these toxins in the dialysate outlet stream. Our results also indicate a significant increase in the dialytic clearances of these solutes. The weakly albumin-bound tryptophan is also displaced by ibuprofen, leading to a slight increase in its concentration in the spent dialysate during the ibuprofen infusion. The water-soluble and unbound solutes urea and creatinine were used as negative controls. As expected, their removal was not increased by the ibuprofen infusion. To our knowledge, this is the first proof-of-concept study of the use of a displacer in patients on hemodialysis in a conventional clinical treatment setting. Overall, kidney replacement therapies have come a long way, leading to improved outcomes in patients on hemodialysis. However, these advancements have done little to augment the removal of protein-bound uremic toxins, a notion supported by mathematical models (21,22). Researchers have attempted to improve protein-bound uremic toxin removal using many different strategies. Activated charcoal suspended in the dialysate can help maintain the diffusion gradient of protein-bound uremic toxins and increase their removal (23). However, this method is not selective and is logistically much more involved. Longer dialysis sessions (24), larger dialyzers and higher dialysate flow rates (25), increasing the frequency and duration of dialysis (3,24), hemofiltration and hemodiafiltration (26,27), increasing the pore size or surface area of dialysis membranes (21), fractionated plasma separation (28), and increased convection (26) are other means of improving the removal of protein-bound uremic toxins. 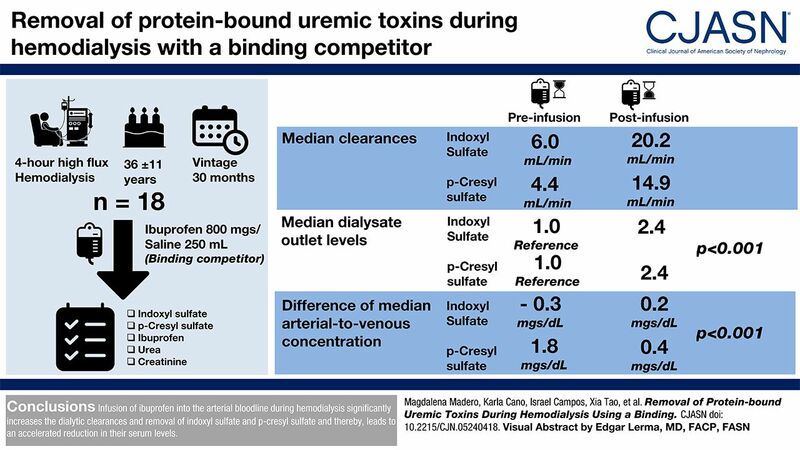 Although the different approaches mentioned above all have the potential (to varying degrees) to result in an increase in protein-bound uremic toxin removal, they suffer from one or more pertinent drawbacks, among which are high costs, cumbersome implementation, potential unwanted side effects, unknown feasibility or clinical applicability, and lack of availability to dialysis centers on a large scale. Our study provides several important insights. First, we introduce the novel concept of displacer-augmented hemodialysis into an in vivo hemodialysis setting. Second, we were able to show a substantial increase in the instantaneous dialytic removal of protein-bound uremic toxins during the infusion of ibuprofen into the arterial line of the extracorporeal circuit. Our proof-of-concept study has answered some fundamental questions, but it has raised others. Ibuprofen is not a perfect displacer, because it is not appropriate for chronic use. Ibuprofen was chosen for this proof-of-concept study on the basis of its demonstrated ex vivo efficacy as a displacer of protein-bound uremic toxins (19). Furthermore, ibuprofen is limited by its inability to cover all albumin binding sites available to uremic toxins. Indoxyl sulfate and p-cresyl sulfate bind to albumin at both Sudlow sites 1 and 2, whereas ibuprofen has strong affinity primarily at site 2. As a result, site 1 may not be blocked by ibuprofen and may remain available for toxin binding. The efficacy of ibuprofen in displacing primarily site 1–binding uremic toxins, such as hippuric acid, is thus expected to be limited (19). Our experiment was planned as a proof of concept study, and we did not want to expose the study subjects to a prolonged infusion of ibuprofen. Regarding future identification of an advanced safe displacer formula for use in a clinical setting, several criteria should be met. The substances need to be safe, should not accumulate in the body with chronic use, and ideally, should cover both sites 1 and 2 binding ligands to effectively displace protein-bound uremic toxins from both binding sites. Previous bench experiments have shown that the addition of a site 1 ligand, such as furosemide, into the displacer “cocktail” increases protein-bound uremic toxin displacement efficiency (19). All displacer molecules included in the formula must be cleared by pathways outside the kidney; have well documented pharmacokinetics, pharmacodynamics, and safety records; and should have low associated costs. It is also important to note that the use of competitor molecules may cause the unwanted displacement of beneficial substances that share the same albumin binding sites. To explore this point, we measured levels of the endogenous amino acid tryptophan during all three study phases and found slightly higher levels of tryptophan in the effluent dialysate during infusion of ibuprofen. One needs to be cognizant of the fact that increased removal of beneficial substances could lead to deficiencies and potentially harmful effects. To that end, long-term studies of repeated displacer-augmented hemodialysis sessions are warranted. In addition, mathematical modeling can provide important quantitative kinetic insights. Finally, one could consider using displacer-enhanced hemodialysis in patients suffering from intoxications with highly protein-bound substances, such as phenytoin or valproic acid (29). Our study has several limitations, most importantly that, overall, the solute clearances that we obtained are lower than what would have been expected on the basis of published data. The main reason is that the dialysate levels of all solutes are lower than expected. We reanalyzed some samples and found materially identical results. Although this reanalysis cannot rule out analytic problems, it showed good internal reproducibility. Although we fully acknowledge the overall low solute clearances, we strongly believe that this finding does not invalidate the broader insight, namely that the infusion of ibuprofen as a displacer increases the dialytic removal of p-cresyl sulfate and indoxyl sulfate (and to a lesser extent, of tryptophan as well). This notion is supported by several strands of evidence, such as (1) this study with its internally-consisted protein-bound uremic toxin dialysate and blood levels shows a distinct increase in their dialysate levels and dialysate-sided clearances, respectively (our clinical research study rejects the null hypothesis of no ibuprofen effect with reasonably robust P values of <0.001); (2) in vitro experiments (20) that show the clearance-enhancing effects of several displacers on protein-bound uremic toxin dissolved in artificial albumin solutions; (3) ex vivo experiments (19) that confirm the augmented dialytic removal of protein-bound uremic toxin from human blood undergoing hemodialysis combined with displacer infusions; and (4) mathematical modeling of protein-bound uremic toxin removal with and without displacer infusions (29,30). In summary, this is the first-in-man study of displacer-augmented hemodialysis. It shows a significant increase in dialytic removal of protein-bound uremic toxins during infusion of an albumin binding competitor. Increased dialytic removal of protein-bound uremic toxins may ultimately lead to improved patient outcomes. The results of this study encourage the quest for safe and effective displacers to enhance the removal of protein-bound uremic toxins in patients on maintenance hemodialysis. X.T., V.M., S.T., and P.K. are employees of the Renal Research Institute. The Renal Research Institute is a wholly owned subsidiary of Fresenius Medical Care North America. S.T. holds performance shares in Fresenius Medical Care North America. P.K. receives honoraria from UpToDate, is an inventor on a patent disclosing the displacement method, and holds stock in Fresenius Medical Care North America. The other authors report no financial disclosures. This article contains the following supplemental material online at http://cjasn.asnjournals.org/lookup/suppl/doi:10.2215/CJN.05240418/-/DCSupplemental. Supplemental Figure 1. Indoxyl sulfate arterial serum concentration over time. Supplemental Figure 2. p-Cresyl sulfate arterial serum concentration over time. Supplemental Figure 3. Tryptophan arterial serum concentration over time. Supplemental Figure 4. Urea arterial serum concentration over time. Supplemental Figure 5. Creatinine arterial serum concentration over time. Supplemental Figure 6. Ibuprofen arterial serum concentration over time. Supplemental Figure 7. Indoxyl sulfate venous serum concentration over time. Supplemental Figure 8. p-Cresyl sulfate venous serum concentration over time. Supplemental Figure 9. Tryptophan venous serum concentration over time. Supplemental Figure 10. Urea venous serum concentration over time. Supplemental Figure 11. Creatinine venous serum concentration over time. Supplemental Figure 12. Ibuprofen venous serum concentration over time. Supplemental Figure 13. Indoxyl sulfate dialysate outlet concentration over time. Supplemental Figure 14. p-Cresyl sulfate dialysate outlet concentration over time. Supplemental Figure 15. Tryptophan dialysate outlet concentration over time. Supplemental Figure 16. Urea dialysate outlet concentration over time. Supplemental Figure 17. Creatinine dialysate outlet concentration over time. Supplemental Figure 18. Ibuprofen dialysate outlet concentration over time. We thank Dr. Björn Meijers (Universitair Ziekenhuis, Leuven, Belgium) for providing p-cresyl sulfate for assay calibration. We also thank Sarunas Daugirdas and Herman Rosen (Weill Cornell Medical College and Icahn School of Medicine at Mount Sinai, New York, NY) for their assistance with editing the manuscript. The study received financial support from the Renal Research Institute. See related editorial, “Enhanced Removal of Protein-Bound Uremic Toxins Using Displacers: Road to Success?,” on pages 324–326.